While there obviously remains the possibility that the United States will once again lash out like a dying lunatic empire, risking the lives of everyone on earth, we might also ask whether or not the U.S. has had a change in strategy or even perhaps whether or not the American “Plan B” is coming to fruition. 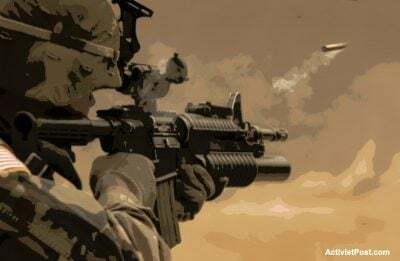 The United States is currently, by stealth, setting up a situation in which it is firmly entrenched in its illegal occupation of Syrian territory. 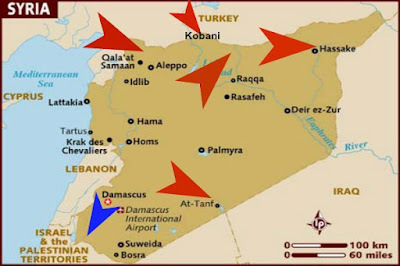 The American bases in Syria which have now reached a count of eight, possibly even nine according to some sources, follow along a distinct line of what will be the formation of the borders of a fractured Syria and the creation of a Kurdistan. Combined with Israel’s illegal occupation of the Golan Heights, the United States has set up a number of bases that traverse Kurdish held territory both in the North near Ayn al-Arab (Kobane) and all along the Turkish border as well as throughout the southeast of the country in territory taken by the Syria Democratic Forces, a brigade of fighters made up of Kurdish extremists and Islamic terrorists. The reason for the U.S. bases is not so much to back up the SDF forces in their military campaigns. After all, the SDF is merely just a hodgepodge of Kurds and Arab terrorists, both of whom are being used and supported by the West to destroy and destabilize Syria. Instead, the United States forces are being strategically placed so as to prevent the SAA from retaking territory in its north and southeastern regions. The U.S. knows that the Syrian military cannot withstand a direct confrontation with the U.S. military and it is becoming abundantly clear that Russia is not willing to risk a direct confrontation with the U.S. over the questions of Syrian border integrity, particularly in the southeastern desert regions. It seem as long as Syria retains a government friendly to Russia and Russian interests, Moscow will be content to see a smaller Syria where a larger one previously existed. With this in mind, it is easy to see the borders of a Kurdistan slowly coming into view. The US/Israeli agenda has clearly been to form a buffer zone inside all Syrian borders from North to East to South preventing Syrian access to neighbouring country borders & territory and reducing Syria to a geopolitically isolated, internalized peninsular. Beeley quotes a FARS News report whose source lists six U.S. military bases in Syria. In March 2016, a Reuters report also discussed the US establishment of military air-bases in North East Syria, in Hasaka and in Northern Syria, in Kobani. Both areas that are controlled by Kurdish forces, maintained by the US, and championed by Israel in their bid for statehood and independence from Syria which would inevitably entail the annexing of Syrian territory. It is obvious not only from events on the ground but also from declarations made early on by U.S. government officials and by published writings of corporate-financier think tanks and Neo-Con organizations that the “Plan A” of the Western coalition was the total destruction of the Syrian government in the same manner as what happened in Libya in 2011. However, six years on, due to the assistance provided by Russia, the Syrian government has held itself together and has even reversed many of the gains made by Western-backed terrorists. Therefore, a “Plan B” has been openly discussed in the same circles as the ones which openly called for the complete destruction of Syria years earlier. Under such an arrangement, Assad would ultimately have to step down from power in Damascus. As a compromise, however, he could perhaps remain leader of the Alawite sector. A weak central government would replace him. But most of the power, as well as most of the armed forces would reside within the individual autonomous sectors — and belong to the various regional governments. In this way, ISIL could be targeted collectively by all the sectors. It should also be noted that a Kurdish state would have both strategic and economic reverberations for Syria as well as for Hezbollah and Iran whose land supply lines would be effectively cut, a massive strategic victory for Israel and thus for the “deep state” apparatus of the U.S. government who wish to see the destruction of all governments who do not bend to its will. The question of whether or not Kurdish groups should be allowed their own ethno-centric state either within Syria, Iraq, Iran, or Turkey is one that has confused many onlookers, particularly in recent years as Kurdish militias have fought valiantly against ISIS (despite working with other radical Islamic terror organizations). First, it is important to separate Kurdish fighting groups like the PKK and YPG from Kurdish people. These groups are not representative of Kurds as a whole. Instead, they represent a radical, violent, extremist ideology of Communism and bizarre cultural Marxism. Second, it is important to separate Syrian Kurds from Kurds in Syria. The former are Syrians who are Kurds or, in other words, Syrian citizens who are also Kurds. The latter are Kurds from other countries who happen to be inside Syria. The region of Al Hasakah, which the Kurdish Nationalist Party (PYD) and its military wing YPG have declared a federal Kurdish state, does not have a Kurdish majority. Al Hasakah Governorate is a mosaic of Assyrian Christians, Armenians, Turkmen, Kurds and Bedouin Arabs. Of the 1.5 millionpopulation of Al Hasakah, only 40% are ethnically Kurdish. Moreover, parts of Al Hasakah Governorate, such as Al Hasakah district, is less than 15% Kurdish (!). In the other large minorities in the area the Arabs and Assyrian Christians form a majority. Declaring a small area with a wide array of ethnic groups as belonging to a specific ethnic minority is a recipe for oppression. The Kurdish population of Al Hasakah has also been heavily inflitrated by illegal Kurdish immigration from Turkey. Kurdish immigration to Syria began in the 1920’s and occurred in several waves after multiple failed Kurdish uprisings against Turkey. It continued throughout the century. In 2011 the Kurdish population in Syria reached between 1.6 to 2.3 million, but 420,000 of these left Syria for Iraqand Turkey as a result of the current conflict. Some Syrian Kurds have lived in Homs and Damascus for hundreds of years and are heavily assimilated into the Syrian society. However, Kurdish illegal immigrants who mostly reside in north Syria, and who could not prove their residence in Syria before 1945, complain of oppression when they were not granted the rights of Syrian citizens. Syrian law dictates that only a blood born Syrian whose paternal lineage is Syrian has a right to Syrian citizenship. No refugee whether Somali, Iraqi or Palestinian has been granted Syrian citizenship no matter how long their stay. In spite of this, in 2011 the Syrian President granted Syrian citizenship to 150,000 Kurds. This has not stopped the YPG from using illegal Kurdish immigrants who were not granted citizenship as a rationale for annexing Syrian land. Those who promote Federalism are imposing the will of a small minority – that is not of Syrian origin – on the whole of Al Hasakah’s population and the whole of Syria. Unilateral declaration of federalism carries no legitimacy since federalism can only exist with a constitutional change and a Referendum. Federalism is unlikely to garner much support from the bulk of Syria’s population, 90-93% of whom is not Kurdish. Knowing this, PYD have banned residents of Al Hasakah from voting in the upcoming Parliamentary elections to be held across the nation. This shows the will of the people in Al Hasakah is already being crushed by PYD. It is undemocratic to continue to discuss federalism as a possibility when it has been rejected by so many segments of Syrian society. Ironically we are told the purpose of the US’ Regime change adventure in Syria is to bring democracy to the middle east. Since the Kurdish population are not a majority in the areas PYD are trying to annex, the past few years have revealed that PYD/YPG are not beyond carrying out ethnic cleansing of non-Kurdish minorities in an attempt to achieve a demographic shift. The main threat to Kurdish ethnocentric territorial claims over the area are the other large minorities, the Arabs and the Assyrian Christians. Salih Muslim, the leader of PYD, openly declared his intention to conduct an ethnic cleansing campaign against Syrian Arabs who live in what he now calls Rojava. “One day those Arabs who have been brought to the Kurdish areas will have to be expelled,” said Muslim in an interview with Serek TV. Over two years since that interview he has fulfilled his word, as YPG begun burning Arab villages around Al Hasakah Province hoping to create a demographic shift. It is estimated that ten thousandsArab villagers have been ethnically cleansed from Al Hasake province so far. The villages around Tal Abayad have suffered the most as Kurdish expansionists seek to connect the discontiguous population centres of Al Hasakah and Al Raqqa. “The YPG burnt our village and looted our houses,” said Mohammed Salih al-Katee, who left Tel Thiab Sharki, near the city of Ras al-Ayn, in December. YPG have also begun a campaign of intimidation, murder and property confiscation against the Assyrian Christian minority. The YPG and PYD made it a formal policy to loot and confiscate the property of those who had escaped their villages after an ISIS attack, in the hope of repopulating Assyrian villages with Kurds. The Assyrians residents of the Khabur area in Al Hasaka province formed a militia called the Khabour Guard in the hope of defending their villages against ISIS attacks. The Khabur Guard council leaders protested the practice of looting by Kurdish YPG militia members who looted Assyrian villages that were evacuated after ISIS attacked them. Subsequently, the YPG assassinated the leader of the Khabur Guard David Jindo and attempted to Assassinate Elyas Nasser. At first the YPG blamed the assassination on ISIS but Elyas Nasser, who survived, was able to exposethe YPG’s involvement from his hospital bed. Since the assassination YPG has forced the Khabour Guard to disarm and to accept YPG ‘protection.’ Subsequently most Assyrian residents of the Khabour who had fled to Syrian Army controlled areas of Qamishli City could not return to their villages. The Assyrian Christian community in Qamishli has also been harassed by YPG Kurdish militia. YPG attacked an Assyrian checkpoint killing one fighter of the Assyrian militia Sootoro and wounding three others. The checkpoint was set up after three Assyrian restaurants were bombed on December 20, 2016in an attack that killed 14 Assyrian civilians. Assyrians suspected that YPG was behind these bombings in an attempt to assassinate Assyrian leaders and prevent any future claims of control over Qamishli. It would be foolish to ignore the signs that more widely spread ethnic cleansing campaigns may occur if Kurdish expansionists are supported, especially since other ethnic groups are not on board with their federalism plans. It has only been 90 years since the Assyrian genocide which was conducted by Turks and Kurds. This history should not be allowed to be repeated. Assyrians have enjoyed safety and stability in the Syrian state since this time. Forcing the Assyrians to accept federalism is not going to ensure their safety. Establishment of a federal Kurdish state in Iraq has not protected Assyrian villages from attacks by Kurdish armed groups either. The campaign of ethnic cleansing against both Assyrians and Arabs in Al Hasakah has already begun and may now only escalate. While Kurds make up only 7-10% of Syria’s total population, PYD demands 20% of Syria’s land. What’s more, the region of Al hasakah that YPG want to annex has a population of only 1.5 million people. Much of Syria’s agriculture and oil wealth is located in Al Hasakah and is shared by Syria’s 23 million people. Al Hasakah province produces 34% of Syria’s wheat and much of Syria’s oil. The oil pumping stations are now being used by ISIS and YPG’s Kurds to fund their war efforts while depriving the Syrian people. Since the majority of Syria’s population and Syria’s government oppose Kurdish annexation claims, PYD will not be able to achieve federalism through legal means. The only way the PYD and YPG can achieve federalism is through brute force. This brute force may backed by the US air force and an invasion by special forces which contradicts international law. Head of PYD Saleh Islam has already threatened to attack Syrian troops if they attempt to retake Raqqa from ISIS. A Kurdish state in Syria as the Iraqi Kurdistan ensures US hegemony in the region. Like the KRG the YPG are already attempting to build a US base on Syrian soil. Russia, which has been an ally of Syria for a long time, will be further isolated as a result. This will once again tip the balance of power in the world. While it is difficult and often unwise to make any predictions when it comes to geopolitics and decisions taken by a government and establishment system gone rogue, we can attempt to analyze what we believe the evidence is showing us. In the case of the recent moves made by both the United States and Russia, it appears that the federalization of Syria is taking form before our eyes. While Russia has acted as the savior of the Syrian government since its entrance into the war, Russia does not seem willing to truly engage the United States in direct military combat over Syrian borders. This approach, while undoubtedly bemoaned by many, is understandable and completely reasonable from the point of view of Russia. After all, the first responsibility of a national leader is to the people of his nation, a concept seemingly forgotten by the people of Western Europe and North America. Still, it seems that the United States is insisting upon at least fractionalizing Syria so that the Syrian government is drastically weakened. A Kurdish state would have both strategic and economic reverberations for Syria as well as for Hezbollah and Iran whose land supply lines would be effectively cut. A Kurdish state would also serve to inhibit an Iranian pipeline. The wild card, however, is whether Syrians will be able to live with the creation of such a large cutout rump state carved out of their own territory. Only time will tell as to how the situation will develop. Considering the fact that two nuclear powers are on opposing sides in this battle, it is safe to say the outcome concerns us all. All images in this article are from the source.